Battle of the Network Shows: Further Viewing, Ghosts of Christmas Past Edition Vol. 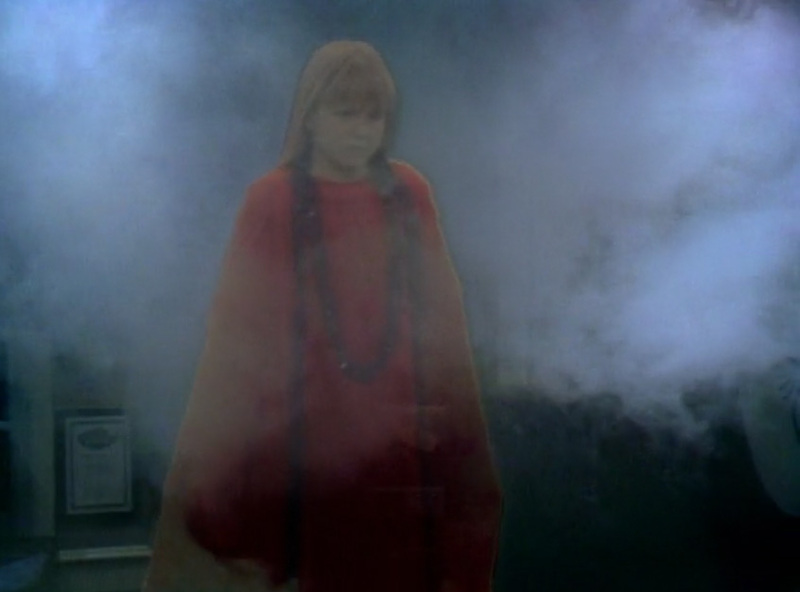 I: Family Ties "A Keaton Christmas Carol"
Further Viewing, Ghosts of Christmas Past Edition Vol. 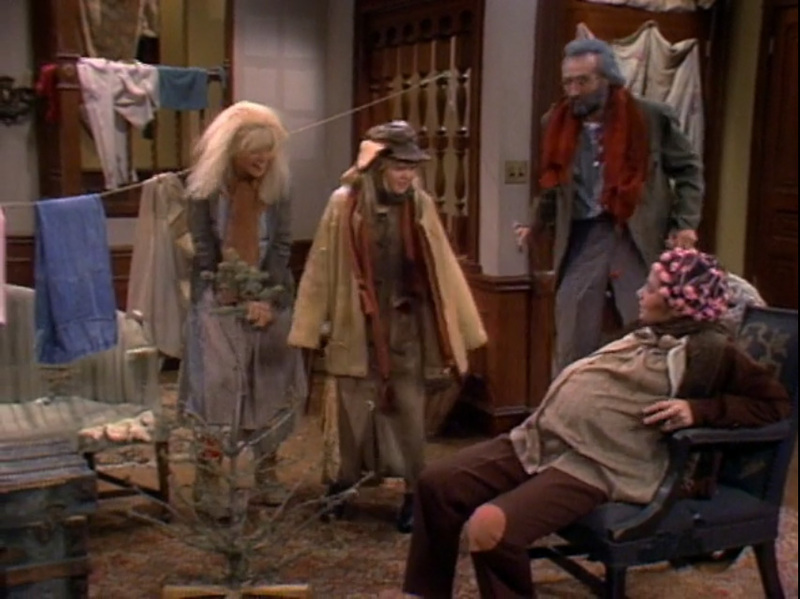 I: Family Ties "A Keaton Christmas Carol"
TV shows have long had special holiday-themed episodes, and for Christmas, many go to that old gem A Christmas Carol for inspiration. Today and tomorrow, we'll look at two shows we covered on the podcast that did their own versions of A Christmas Carol. Up first, Family Ties "A Keaton Christmas Carol," which aired December 14, 1983, a mere month and a half before "Say Uncle." 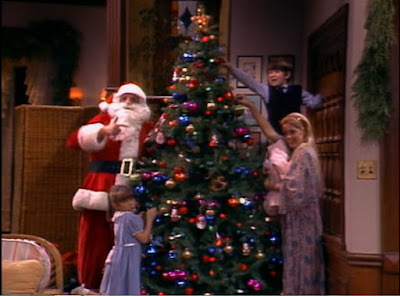 The episode opens with most of the Keaton clan finishing up trimming the tree and naturally in a festive mood. Alex hasn't appeared, but when he does, well, maybe he should have stayed away. He's in a mood. He doesn't like Christmas and considers it a lot of baloney. He's so cranky that he forgot to pick up Jennifer's cough medicine, suggesting he'll pick it up tomorrow until Elyse reminds him that tomorrow is Christmas and all the shops will be closed. He even refuses to pose for the traditional family photo, thinking it dumb that to strike the same poses every year. Upstairs, he yells out his window at some Christmas carolers, mutters a "bah, humbug," and settles in for a long winter's nap. Instead smoke billows through the room, and Jennifer appears decked out in red, only she's not Jennifer. She's the Ghost of Christmas Past, and she takes Alex on a journey...downstairs...but downstairs to a living room from ten years before. We see a young, cheerful yet cheerfully Republican Alex (he takes some time to call the Watergate investigation a witch hunt) who loves Christmas. Sure he and Mallory and even baby Jennifer recognized Steven through his Santa disguise, but they all have a good time, and lil' Alex even suggests that they turn their photo poses into an annual tradition. Back in bed, the Ghost of Christmas Future pays a visit in the guise of Mallory (no time for the Ghost of Christmas Present here). She shows him a grim, dare I say, dyskensian future, and the cast gets to have fun playing older versions of themselves. The Keatons (and apparently the world) have fallen on hard times. To make ends meet, Elyse does other people's laundry and Jennifer farms dirt in a wheelbarrow (the family's only form of transportation). 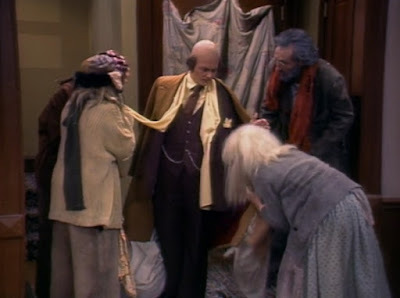 Mallory's on baby number four, and Steven looks like he wandered in from the set of A Christmas Carol movie. The episode ends with a changed Alex excitedly offering lame gifts to everyone. 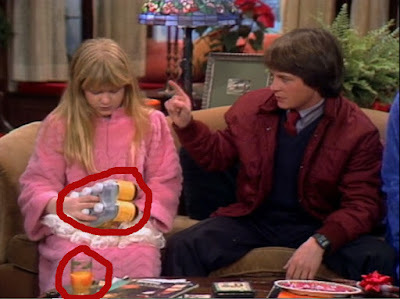 He had to get them from 7-Eleven, so he had limited options (most notably a six-pack of cough syrup for Jennifer--I hope she used it up before Uncle Ned visited). Although they don't understand his behavior, the family accepts their goofy gifts in the spirit Alex intended, and he opens the door to his last present--the carolers! six-pack of syrup or orange juice?" While this episode doesn't reach the heights of "Say Uncle," it offers plenty of laughs, the fun of seeing young Alex, and of course a heartwarming lesson--don't act like a scrooge or you might lose your hair. Sure, we don't ever learn why Alex hates Christmas, and it frankly seems a little out of character, but the writers and the cast get to have fun with the characters, casting them in an absurd light they couldn't otherwise, all while imparting some warmth and wisdom. Who can say, "bah, humbug," to that? Merry Christmas, Ubu, Merry Christmas. Good dog. 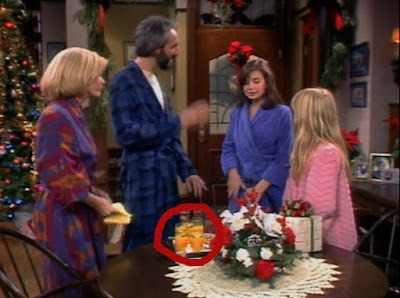 The Keatons would have been better off had Future Alex did everything else the same except for throwing his family a bone and giving them all cushy no-show jobs.